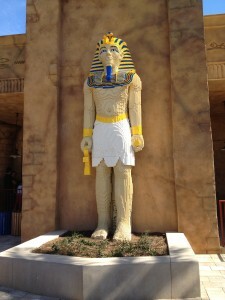 Lego Pharaoh sez, "Build your LinkedIn connections brick by brick!" Let’s say you attended a fabulous networking event last night. Today, you’ve carved out some time from your frenetic schedule to do your follow up. Let’s further say most, if not all, of your new friends use LinkedIn and would be happy to receive an invitation from you to connect. Those business cards are lined up on your desk, ready to be scanned in or organized the old-fashioned way. You log onto LinkedIn, briefly admire your “Views/Appeared in Searches” statistics, and start entering names into the People search box. That first new contact populates your view, and you anticipate the increase in your number of LinkedIn connections (yeah, but who’s counting?). Your fingers twitch with social networking giddiness; are you ready to execute (no violent imagery deliberately intended – create?) the perfect LinkedIn invitation?!? Do the Right Thing – Enter the Email Address from Your New Friend’s Business Card: Don’t turn into the laziest networker in the webosphere by claiming your new contact as a “Friend” or “Colleague” at your place of work. Saying you already have a connection with your recent acquaintance is akin to going to your high school reunion and pretending you really should catch up with that popular guy or gal who never spoke once to you in four years. Also, you just might annoy your invitee. If you don’t intend to save the business card, at least get one good use from it before you file it in your recycle bin! Coffee, Tea, or Me(et Up)? : Do you sense a kindred spirit or just know you CAN help your soon-to-be LinkedIn linchpin? Then end your invitation with an offer to schedule a one-on-one meeting. By doing so, you set in motion the possibility of a deeper networking connection and future referrals. Whether you agree to a quick morning coffee grab or a more leisurely lunch or dinner, you’ll be glad you took the time to craft your perfect LinkedIn invitation. Do you have some tips or suggestions of your own regarding LinkedIn invitations? Please share in the form of a comment – thanks for your eyeball attention! Right on – make good use on your new connections and start a conversation on Linkedin. Thanks for stopping by, Tara – glad you like my LinkedIn suggestions!